Our journey began at the Kyoto Station where we’ve boarded the direct train to Nara. After app. 40 minutes of ride, we arrived to Nara JR station. 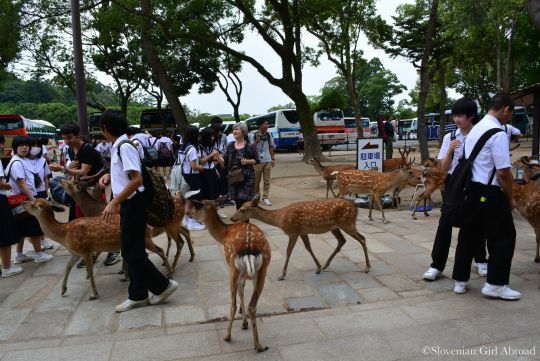 There we took the bus to Nara Kōen, a large park in central Nara where a hundreds of freely roaming sika deers live. It’s hard to missed them as they are everywhere. In Shinto religion deers are considered to be messengers of the gods. Nara’s app. 1200 deers become a symbol of the city and were even designated as a national treasure. 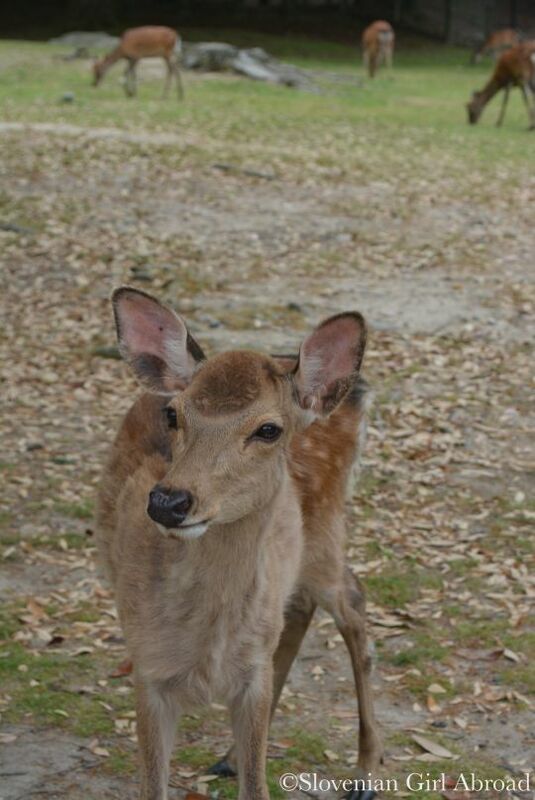 We’ve bought a package of deer crackers for 150 JPY by the first stand and feed some of the deers. With their doe eyes and wet noses were definitely the cutest creatures. Asking for food, some of the deers rubbed against us, nudged us with their foreheads and some even bowed their heads. As the bowing is an important feature of Japanese etiquette, we joked, even Japanese deers are polite. Prior to our visit, I’ve read warnings the deers can be aggressive while feeding (there are even notices around the park) but we had no such an experience of aggression. Even the deers with largest antlers were sweet and gentle. One even allowed me to touch his antlers and I was surprised how soft they were. 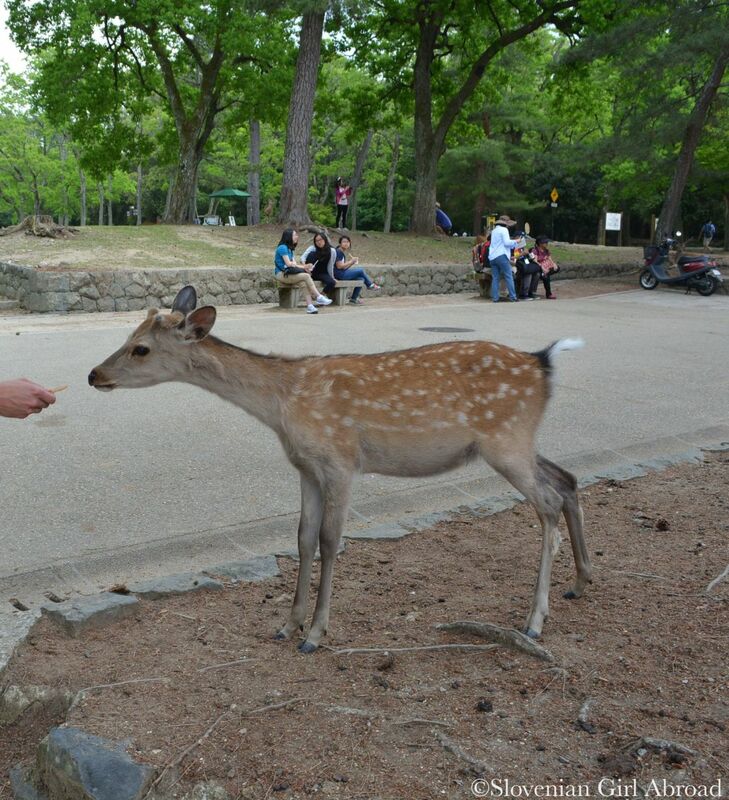 Once we had hung out with the deers in the park, we moved to nearby Todai-ji temple to explore Nara’s rich heritage. 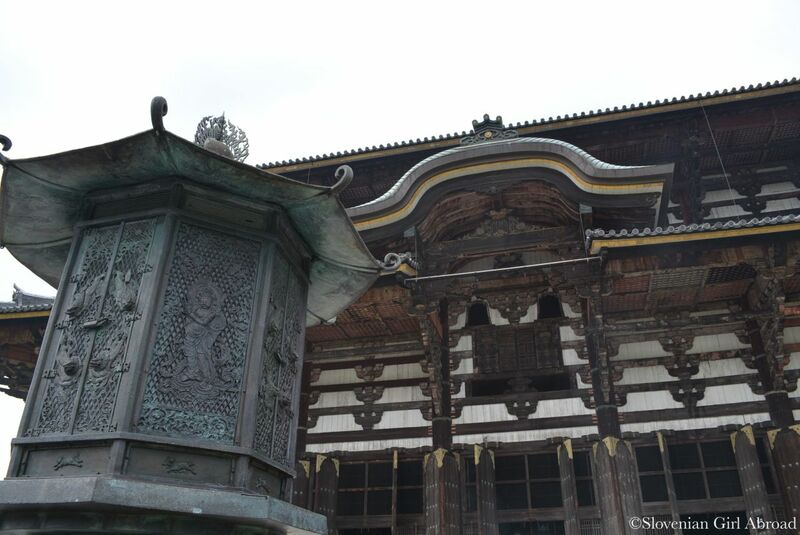 From 710 to 784 was Nara not only political, but also spiritual and cultural centre of Japan. The heritage form that era was recognised by the UNESCO. 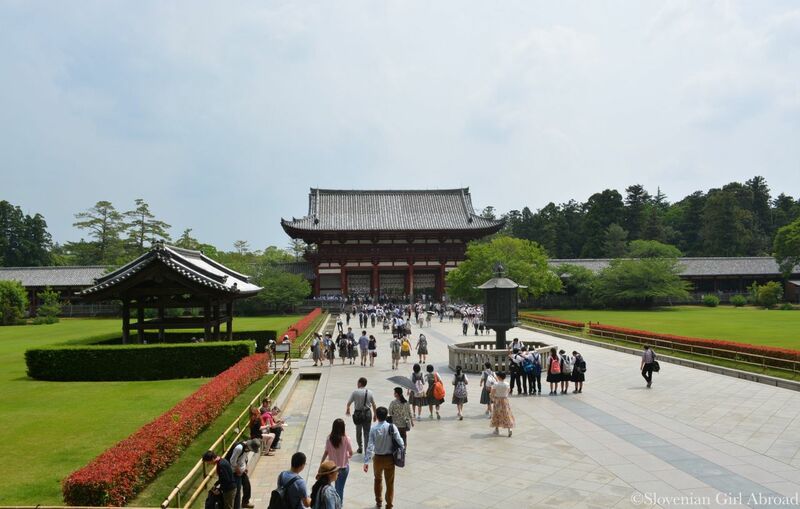 The city’s historic monuments – temples, shrines and remains of the imperial palace were inscribed to World Heritage List under the name “Historic Monuments of Ancient Nara”. Todai-ji, also known as the “Great Eastern Temple” is one of Nara’s Buddhist temples inscribed to the World Heritage list and is spectacular. 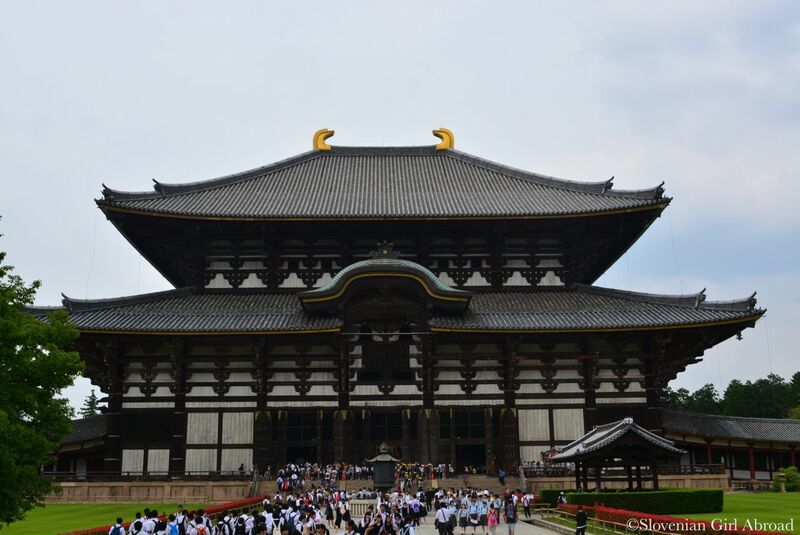 It is considered to be the one of the largest wooden building in the world. It is massive and beautiful. Its shape reminded me of samurai helm. 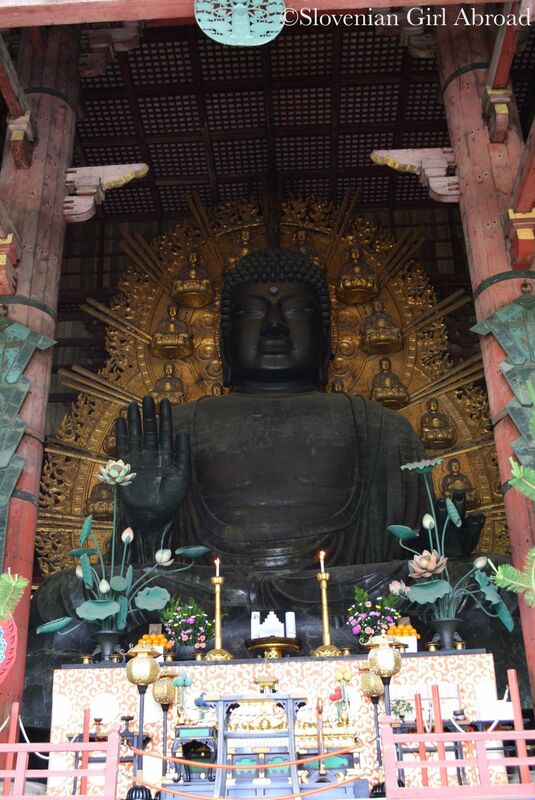 In Todai-ji’s main hall, one of the world’s largest bronze statues of the Buddha – 15 meters high bronze Daibutsu, can be found. While walking around the Big Buddha, we’ve spotted several smaller statues – Buddha’s guardians each carrying its own symbolic meaning. The most interesting part of Todai-ji temple is probably a pillar with a hole in its base that supposed to be the same size as the Buddha’s nostril. It is said that if you could crawl through, you’re granted enlightenment. Of course we had to try. We stepped in a queue and wait for our turn. Closer we get, the smaller the hole appeared to be. When it was finally our turn, my husband decided not to go and it was on me to try to squeeze through the hole. Standing in front of the hole, it appeared to be even smaller then it looked from a distance. 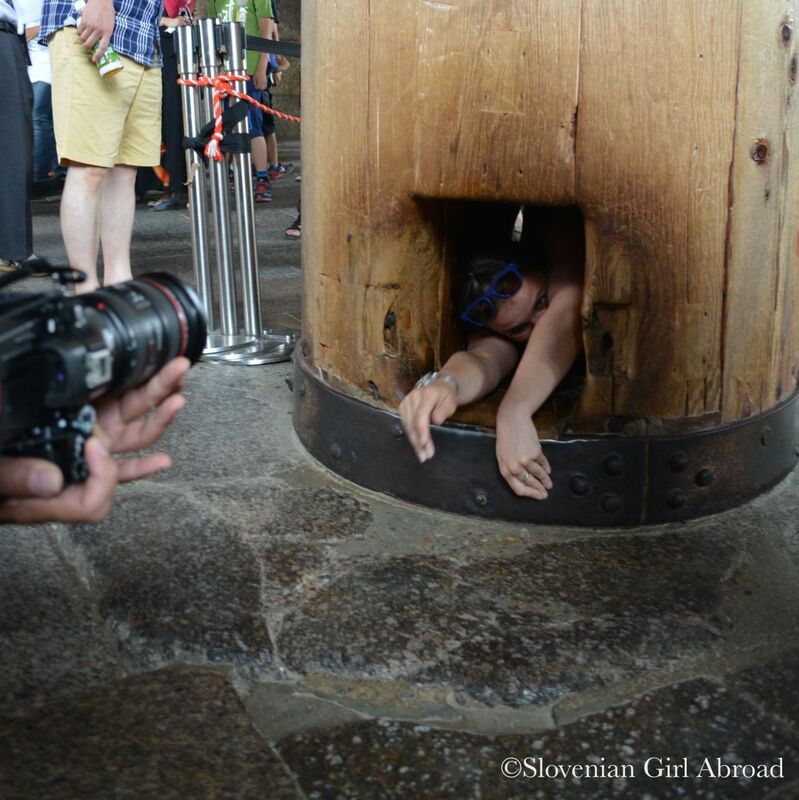 I gave it a try, but when I was already inside the hole and had my arms on the other side and I saw my husband and a bunch of tourists taking pictures of me. The panic took over me. “What if I got stuck?”, I thought, “That would be a fun sight for them to photograph!” With such thoughts I rather pulled back. When My husband came to me laughing. I couldn’t resist laughing with him. Although it was a bit embarrassing, it was fun experience. After my failed attempt to achieve enlightenment, we slowly moved towards the exit. 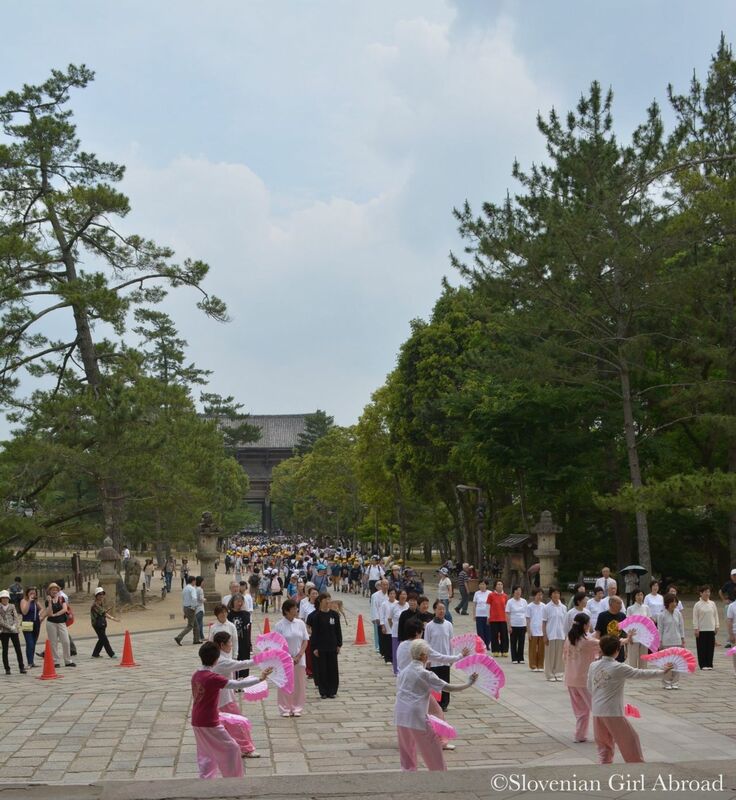 Before we left the temple, we observed a group of old Japanese ladies dancing. We stopped in the park to feed the deers with the rest of deer crackers and take a bus back to the train station. We stopped at the lovely Japanese bakery for some snacks and took the train to Kyoto. At the Uji station we switched the fast train for the slower one that took us to Inari station – a station just a step away from the famous Fushimi Inari-Taisha shrine. Although it was already late afternoon, the access to the shrine was still open. 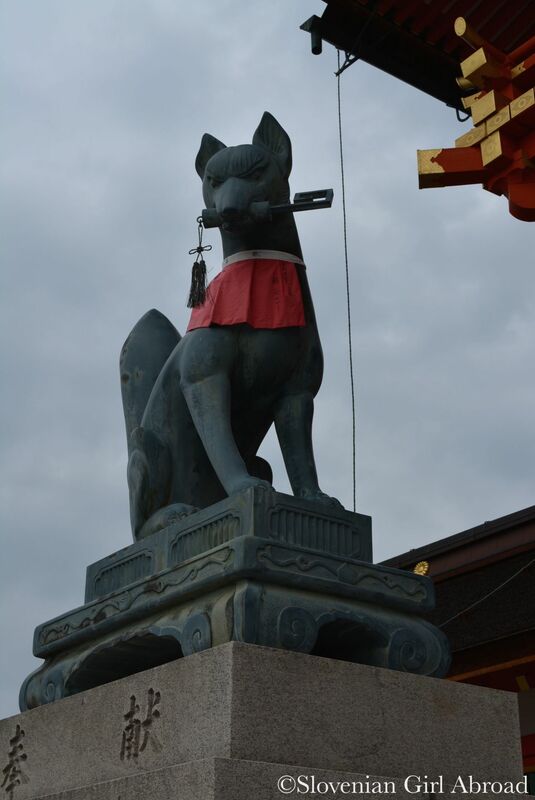 Fushimi Inari-Taisha shrine is devoted to Inari, a Japanese deity of foxes, rice, tea, sake, fertility, agriculture, industry and general prosperity. 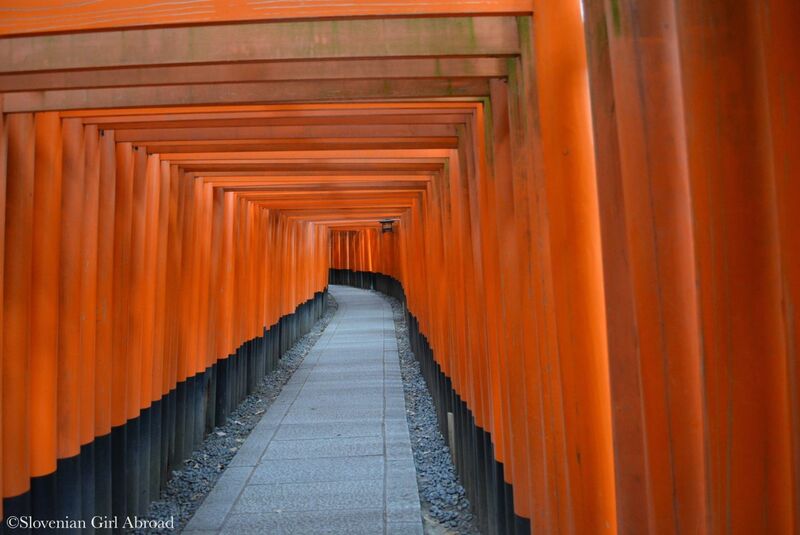 It is one of the most famous Japanese shrines and I can definitely understand why – it is amazing. 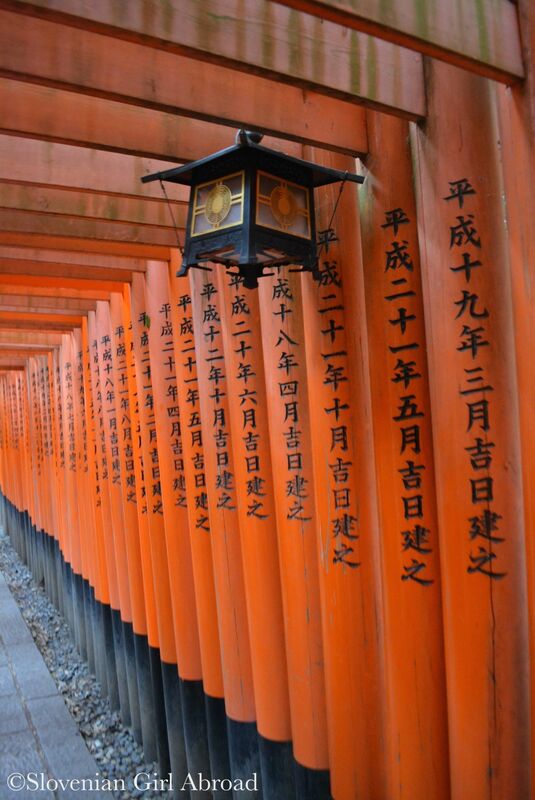 From the main shrine we walked uphill to the tori gates, Fushimi Inari-Taisha shrine is famous for. We soon discovered the endless gates cover the pathway straight to the top of the hill. I was aware of the toris, but I didin’t expect they will cover such a wast area. Walking through them uphill was an amazing experience. The higher uphill you get, the better is view to Kyoto. 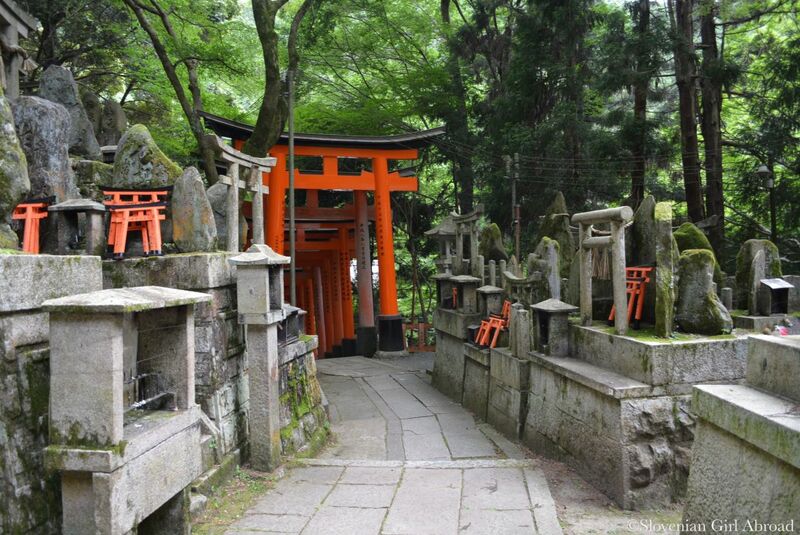 Every here and there by the pathway, the bigger or smaller complexes of small shrines decorated with tiny red tori gates can be found. We didn’t get to the top, as it was already getting dark and we were already getting hungry. We returned back to the valley. We took the train to Kyoto where we went to the dinner to the same sushi restaurant we’ve been a day before. Again, we’ve enjoyed the delicious sushi and returned back to our hotel tired, but reacher for a bunch of amazing memories. 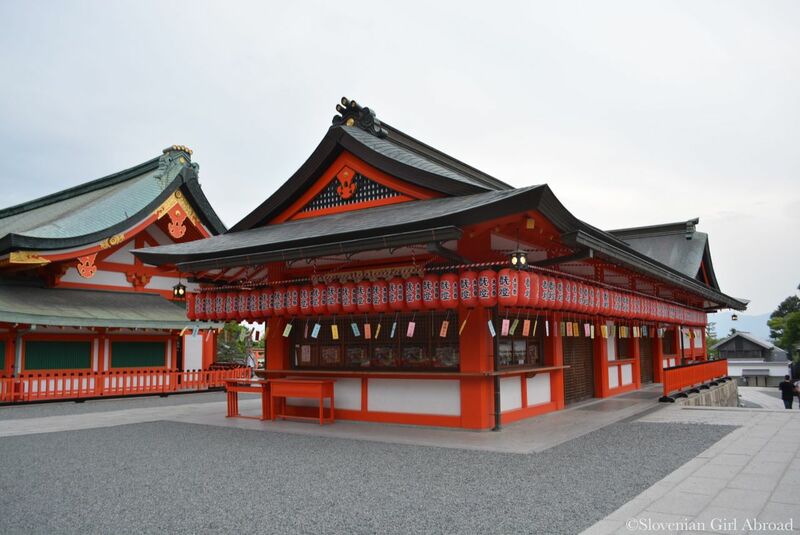 Wow – Nara and Fushini Inari on the same day is quite a schedule. It seems most people don’t get to the top of Fushini Inari and I remember getting sidetracked all the time by exploring little pathways. However, the views over Kyoto are great. I love Japan and Nara my grandma is Japanese and I’ll be going back I may this year . Great post! After reading your great post, I wish I had gone from Kyoto to this fabulous place. The deer are beautiful as are the tori gates of the shrine. Thanks for a really interesting post with lovely photos. Reminds me of my trip to Kyoto a couple of years back. We didn’t have time visit Nara then. Oh how I want to go to Japan. I talked about it with my husband, and it’s not happening this year, but fingers crossed for next. In the meantime I’ll keep reading your posts:). Nara is brilliant and the perfect day trip from Kyoto. Man there were a lot of deer! Wow! I would have really liked to feed the deer. What a beautiful place – so rich in culture and tradition! The culture is fascinating and I just love the food. I would love to have that experience over there. Thanks for sharing your experience. I’m hoping to visit Kyoto and Nara later this year. Japan is so beautiful and unique, isn’t it? Wow! it’s nice to see those Sika Deers. Just wanted to visit that place to discover and enjoy somehow. This brings back some memories! Although the deer weren’t quite as sweet with us! 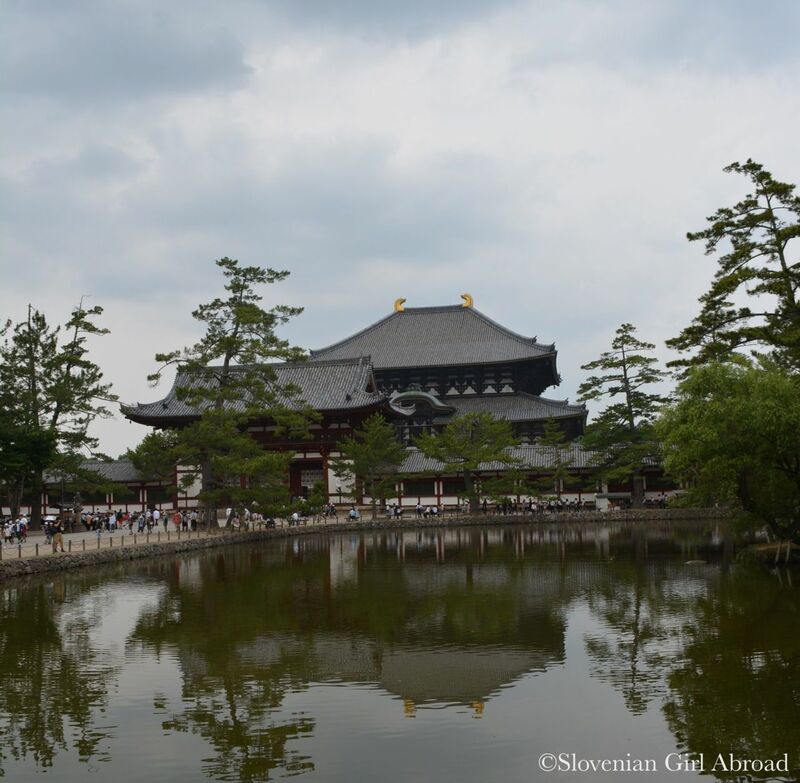 Excellent post, I visited Kyoto and Nara in 2012 we had an awesome time but not enough wish I can go back. You have inspired me to blog about it. Thanks!